“Flowers in Paradise” is a beautiful combination of flowers that captures my heart. This combination of flowers where so incredible and found in the most unusual place at each end of a jumping fence at an Equestrian competition. The way I painted the original “Flowers in Paradise” is reminiscent of the Venetian painters who used a dark backgrounds to highlight magnificent flowers. I decided that a Dark Royal Blue would be a modern rendition against the bright gold frame to highlight the organic beauty of our world. 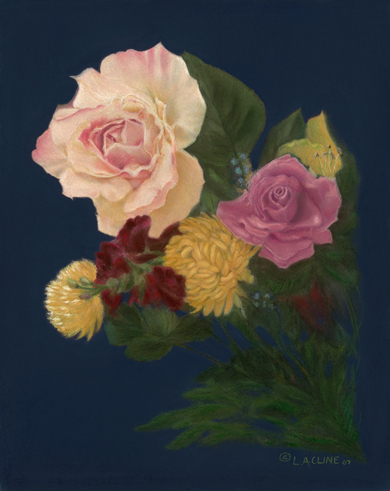 This most magnificent “Flowers in Paradise” Archival Digital Fine Art also portrays the pastel medium and the depth and softness of the flowers. The exquisite wooden gold textured frame, shine and pattern of this frame gives a special sparkle to the “Flowers in Paradise”. I lovingly hand painted this fine art with oil paint and added an archival clear protective spray that preserves the piece with UV protection. 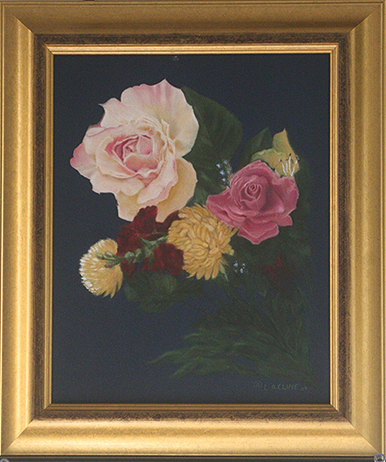 This art measures 17 1/2″ X 21″ with the frame. There is an edition of 2 hand painted and framed with this frame. There is one left. If you would like more information about this “Flowers in Paradise” Limited Edition or any other work of art on this site please contact me directly.